Looking for an omelette to impress your brunch guests, but your omelette making skills aren’t up to par? 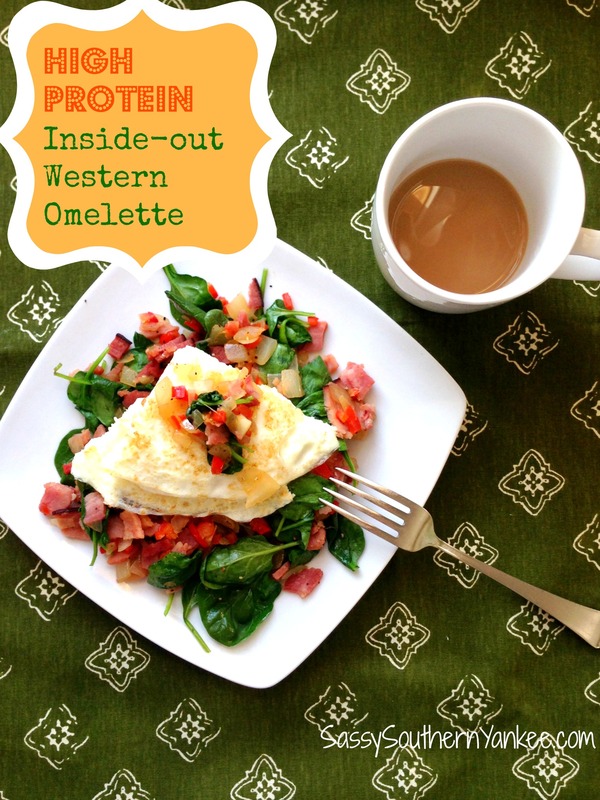 Try this Easy Inside-out Western Omelette! You just cook all the ingredients you want on the inside of the omelette then you can make a crepe style omelet or scrambled eggs and place them on top. I recently started counting my Macro’s to help aid in my weightless/ health journey. Egg-whites are my new best friend and this Western Omelette hit the spot! It’s healthy, low carb and super easy to make. With only 11 (g) Fat, 25(g) Carbs and 58 (g) Protein it’s perfect. You can mix and match whatever your favorite omelette combinations are. In a medium skillet spray a bit of non-stick cooking spray; heat over medium-low heat and add the onions, salt and pepper. Sauté the onions for about 3-5 minutes until they are translucent. I like to let them get just a bit of caramelization on them. 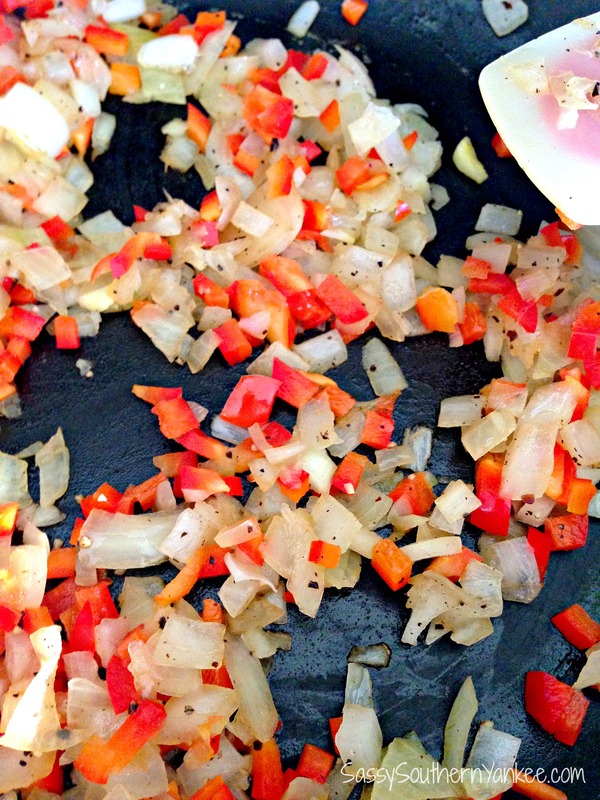 Next add the diced red pepper and ham; cook until the red pepper is tender. Remove from the heat and add the spinach gently tossing so that it gets slightly wilted. Place the mixture on a plate. Using a piece of paper towel wipe the pan out; then spray with a bit more of the non-stick spray. Return the pan back to the stove over medium heat; add in the egg-whites. I like to scramble the egg-whites a bit with my spatchula in the center of the pan. This incorporates a bit of air into the omelette; then allow the omelette to cook until the top is just about set (at this point if you wanted you could just continue to scramble the eggs and serve them that way too). Once the omelette is just about done use your spatchula to flip the omelette over; cook for an additional minuet. You can then use your spatchula to fold the egg-whites over into a crepe style (in half, then fold in half a second time, so it looks like a piece of pie). 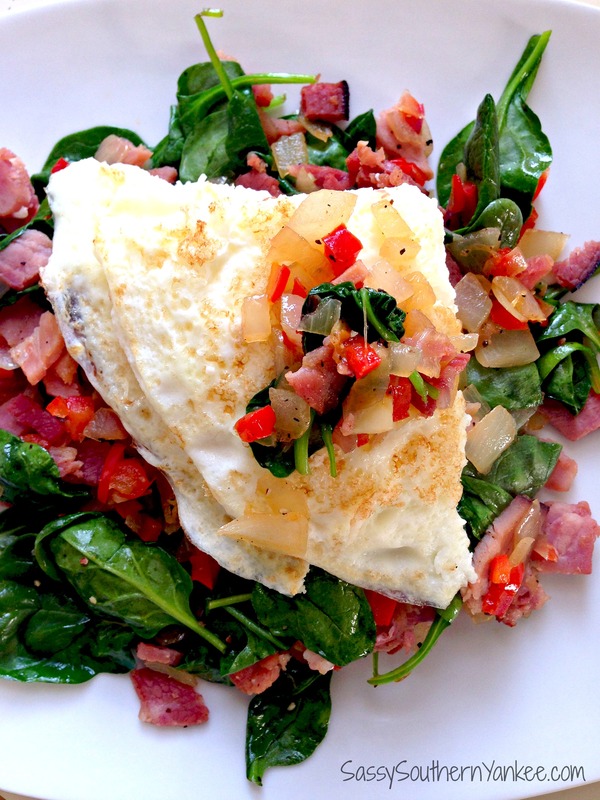 Place the eggs on top of the ham, onion and pepper mixture. Salt and Pepper to taste and serve immediately; there’s nothing worse than cold eggs. Looking for an omelette to impress your brunch guests but your omelette making skills aren't up to par? Try this Easy Inside-out Western Omelette! In a medium skillet spray a bit of non-stick cooking spray; heat over medium-low heat and add the onions, salt and pepper. Sauté the onions for about 3-5 minutes until they are translucent. I like to let them get just a bit of caramelization on them. Next add the diced red pepper and ham; cook until the red pepper is tender. Remove from the heat and add the spinach gently tossing so that it gets slightly wilted. Place the mixture on a plate. Once the omelette is just about done use your spatchula to flip the omelette over; cook for an additional minuet. You can then use your spatchula to fold the egg-whites over into a crepe style (in half, then fold in half a second time, so it looks like a piece of pie). 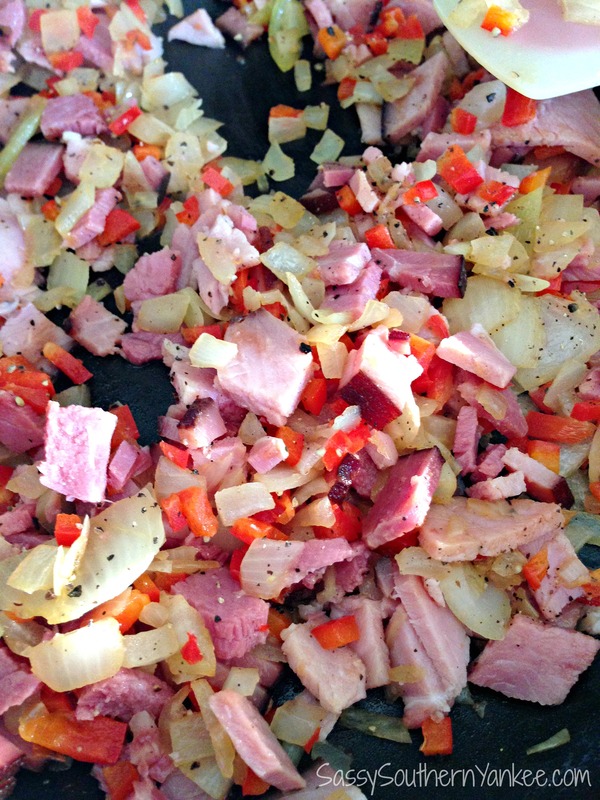 Place the eggs on top of the ham, onion and pepper mixture. Salt and Pepper to taste and serve immediately; there's nothing worse than cold eggs. This entry was posted in Breakfast and tagged Brunch, Clean Eating, Gluten Free, High Protein, Low Carb, Macros, Omelette, Paleo, western.